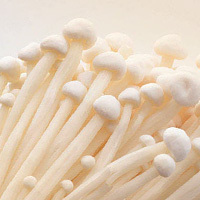 Enokitake mushrooms are a thin type of edible mushroom that can be found naturally on trees such as the broadleaf tree. One characteristic of enokitake to note is that despite being low in calories they contain nutritional value. However, overeating enokitake mushroom should be avoided due to the fact that it contains flammutoxin. Cooking is recommended before eating. The calories in Enoki Mushrooms per 85g(1bag) is 19 calories. Enoki Mushrooms is calculated to be 22Cal per 100 grams making 80Cal equivalent to 363.64g with 6.46g of mostly carbohydrates、2.3g of protein、0.17g of fat in 85g while being rich in vitamins and minerals such as Niacin and Folate.